In general, 180 degree feedback is used to give individuals in your organization a clear idea of what they’re doing right, what they could improve, and how their supervisors perceive them. A 180 degree assessment includes two parts: self-feedback from the individual, and outside input from the individual’s supervisor. Individual employees rate themselves within specific competency areas. They answer a series of questions designed to gauge their level of skill in various aspects of their work. The supervisor answers a similar set of questions about the candidate, giving an outside look at how the employee is actually performing. These two sets of data are then compared to see where the employee truly stands. In some cases, your personnel may have false ideas of what their job entails, or they may overlook some of their deficiencies. The supervisor feedback clears up any misconceptions the employee has while opening up constructive communication between the two parties. The competencies measured in 180 degree assessments vary depending on the person. For instance, someone in an entry-level position will have different skill requirements than an upper-level supervisor or manager. Communication and interpersonal skills are vital to personnel at any level in an organization. Often, an individual may have false ideas of how well they communicate with others, which makes the questions in this area invaluable. Whether an employee has consistent contact with their customer base or not, they need to be focused on providing for their needs. Personnel should have a solid view of what needs their customers have and how they meet those needs in their employment capacity. Both low-level employees and higher level managers have some degree of influence over others. What influence they have may be skewed in their own mind, so the two-pronged approach to assessment in a 180 degree review can help clear things up. Employees need to understand how their organization works. An assessment that covers this area helps ensure individuals are aware of their responsibilities and how they impact your organization as a whole. Leaders need to be able to manage conflict effectively. They may believe that they are good at resolving conflicts successfully, but their own supervisors may see a different situation. Testing this area not only clarifies misconceptions a manager may have, but it also goes on to make sure future conflicts are prevented by tying up any loose ends. Everyone within an organization has some level of decision-making they need to do on a daily basis. The ability to parse through problems and come up with effective solutions helps keep a company running, and deficiencies in this area can leave issues unresolved or mismanaged. The capacity to handle one’s own conflicts without casting blame on others is vital to any healthy workplace. Those who lack appropriate levels of self-responsibility are frequently unaware of that fact, which means outside feedback is vital. Employees need to be able to work well with others, and managers need to be effective at team-building. Unfortunately, it’s very easy to miss what one may do wrong in these areas, so the feedback gained through a 180 degree assessment can help rectify unhealthy misconceptions and create a more cohesive workforce. A 180 degree assessment measures both the strengths and weaknesses of individuals within an organization. First off, 180 degree feedback gives supervisors and managers an opportunity to give individuals praise for their strengths. It’s important to see that employees receive the recognition they deserve, and in many cases, remuneration for their efforts may be appropriate. Naturally, the nature of these assessments also illuminates areas where an employee could improve. Anyone within an organization can probably do better at something, and getting supervisor feedback on what that might be can spark the creation of a plan to help individuals progress. An employee may have their own ideas on where they excel, but those ideas may not be totally accurate. As their question responses are compared to those of their supervisors, it helps to clear up areas where they may be underperforming. For instance, an employee may feel they are great at relating with others, but their supervisor has received reports from the individual’s coworkers that detailed long-standing personal grievances. The assessment brings the supervisor’s knowledge into contact with the individual’s misunderstandings and encourages resolution. Sometimes, an employee may have inaccurate ideas of what is expected of them, whether in terms of their duties, the quotas they need to meet, or the behaviors they should exhibit in the workplace. 180 degree feedback gives the supervisor an opportunity to clarify expectations and make sure everyone is on the same page. Situations where a 180 degree assessment may be appropriate might include when an employee is underperforming, there are unresolved conflicts in the workplace, or when someone shows potential for future leadership opportunities. In all these cases, 180 degree feedback helps facilitate conversations that lead to the resolution of problems and future leadership training. 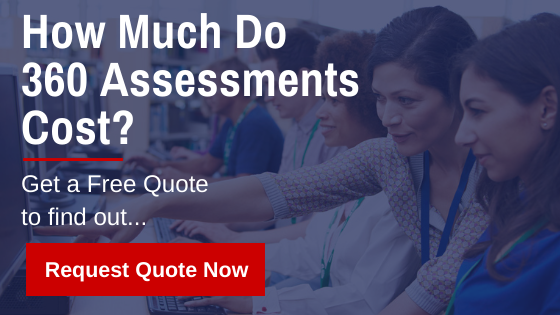 What’s The Difference Between A 360 And 180 Degree Assessment?